Current clients with an ACHWorks account can use MCA Suite to initiate daily debits (and credits) on ACHWorks by integrating MCA Suite with their ACHWorks Payment Gateway. Below are the steps you will need to take to configure you MCA Suite instance to be integrated with ACHWorks. You will need to contact ACHWorks to obtain Company and Company Key information to integrate MCA Suite to the ACH Works SOAP API. If you have existing credentials from a previous CRM, you will need to contact ACH Works for another set of credentials. Otherwise the two systems will compete with pulling updates. You will be prompted to select your Payment Gateway type; choose “ACHWorks” from the dropdown menu. You also need to name your gateway. This can be any name that is particularly appropriate or helpful to you; clients typically use their company name as the gateway title. Click on SAVE when you are done. The “AccountSet” number ties the customer/billing schedule to the particular bank or account into which the money collected from the merchant will be deposited (which is pre-setup with ACH Works). If you have more than one AccountSet, you can set a “default” AccountSet on this page (ex., “01”) but then change the AccountSet number on the actual Billing Schedule/Debit page, should money from that particular debiting schedule need to go into a different account. You will also be asked to set up a “Default Originator” Name. The Originator Name is basically your company’s name as it appears on the customer’s bank statement. Clients typically use their business name, or some shortened form of their business name, as the Originator Name. The recommended approach is to enter the same company name you used to obtain your ACHWorks account to prevent any confusion with ACHWorks and the merchant being debited. Once you have filled out these fields, click SAVE and wait for the credentials to be verified. 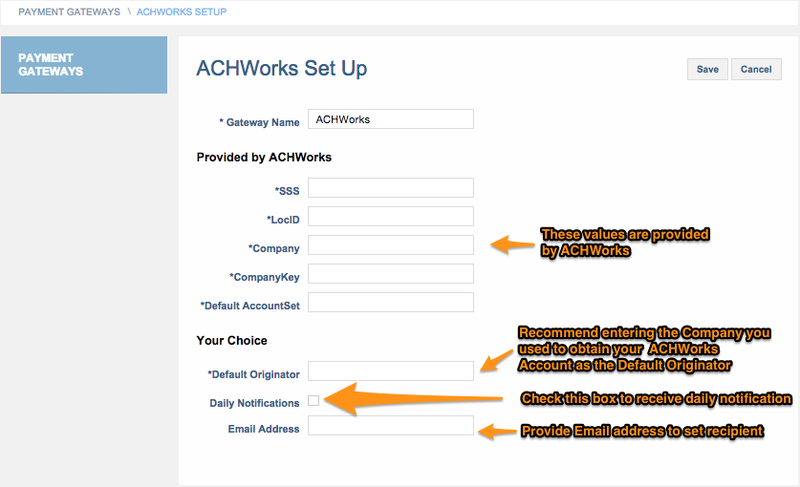 After the Gateway Setup information has been verified, your ACHWorks gateway is ready and you can start setting up Billing Schedules (i.e., customer debits). To do this, first you need to make sure the customer you are debiting and deal you are debiting for, are ALREADY entered into your MCA Suite as a Merchant Company and Deal. In addition, you can only debit on deals that are considered funded or “tracked” in MCA Suite. So after entering your merchant company and attaching the deal to it, make sure you click on the “Track Deal” button on the deal to “fund” it in the system (you will be prompted to enter funding information like funded date and administrative fees). 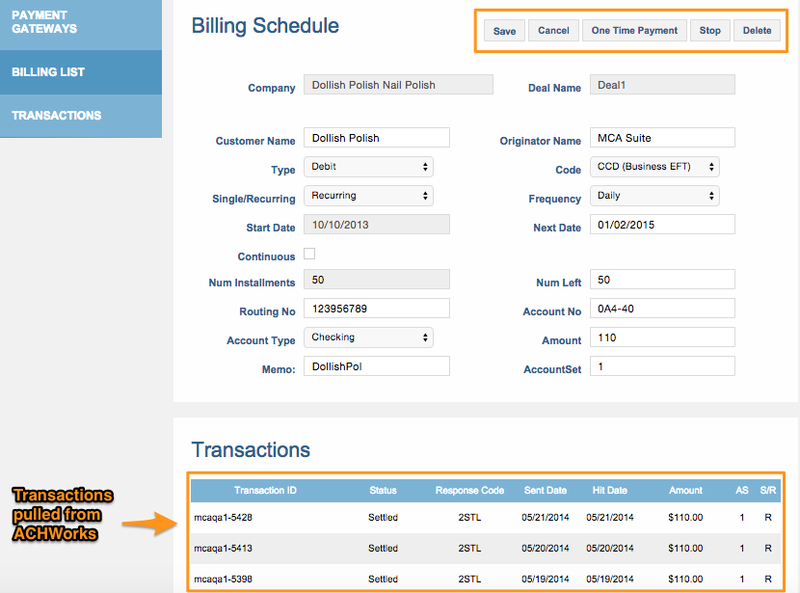 You will be taken to the (Add New) Billing Schedule page, where you will enter the details of the scheduled debit. a) Company – this refers to the merchant company/customer you are debiting. 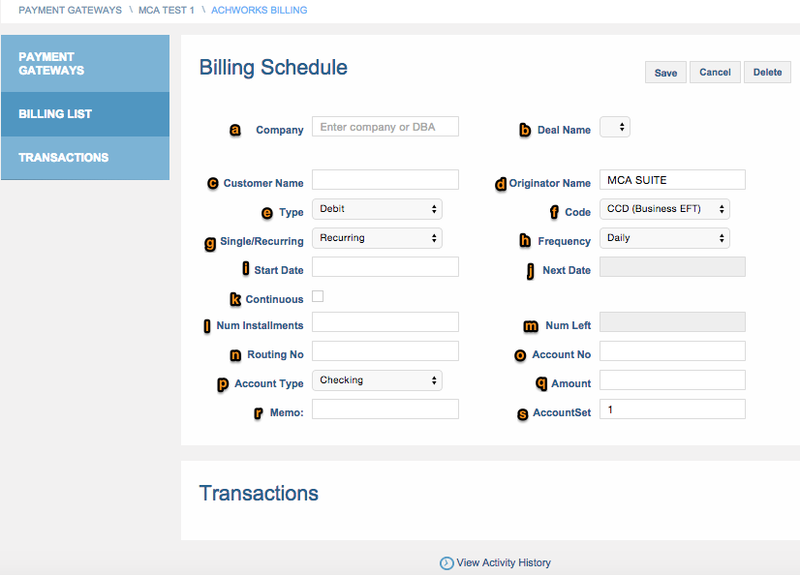 This field functions as a LOOK-UP field against your current merchant company contacts in MCA Suite. Simply start typing the name of the merchant customer, and the company should appear in a drop-down menu. Select the company. b) Deal Name – once you have selected the company you are going to debit, the “Deal Name” field will populate with all the TRACKED (i.e., funded) deals available for that merchant company. Selected a deal from the menu (if the merchant has multiple deals running) – this will be the deal you are collecting on. c) Customer Name – name of the merchant, basically the same thing as the Company field above. Just make sure this Customer Name matches as closely as possible the customer name ACH Works has. d) Originator Name – this is the default Originator Name you entered when first setting up the gateway. The Originator Name is your company’s business name as it appears on the customer’s bank statement. If you have multiple originator names, you can edit the default name here on the Billing Schedule page. e) Type – select Debit or Credit; you will mostly be selecting Debit as the schedule-type. g) Single/Recurring – select whether this will be a one-time debit, or a recurring debiting schedule. h) Frequency – selecting the frequency of the debit: Daily, Weekly or Monthly. i) Start Date – enter the date you would like the first transaction to send. There are two “transaction” dates – the sent date (the first date that the transaction runs) and the hit/effective date (the NEXT day – this is the date the debit hits your customer’s bank account). If today is July 31 and you would like the first debit to hit your customer on August 1, put “July 31” as the Start Date. NOTE: We run the batch at 6pm EST, so any transaction you would like to start “today” must be entered before 6pm EST. j) Next Date – automatically determined by MCA Suite, based on Start Date and Frequency. k) Continuous – if you would like the debit to run until you manually turn it off/end it, select the Continuous checkbox. If you select this option, you will NOT be prompted to enter a number of installments. l) Num Installments – if you do NOT select the continuous checkbox, you will need to specify the number of installments you would like us to run through ACH Works. This number basically refers to the number of times we “contact” ACH works with the debit information – it will not exclude/skip over errored payments or NSFs. m) Num Left – automatically calculated by MCA Suite based on Num Installments and days passed. n) Routing No – your customer’s checking routing number. o) Account No – your customer’s checking account number. p) Account Type – selected Checking or Savings. q) Amount - enter the amount you wish to debit the merchant. r) Memo – optional field; a small description, shown on customer’s bank statement.Account Set – which bank/account these debited funds will be deposited into. A default Account Set was entered during the gateway set-up. But if you have multiple accounts, you can specify the account on a billing-schedule basis by entering a different Account Set number in this field. s) AccountSet - this is the account the money will be deposited to your bank account. When you have reviewed and verified this information, click on SAVE to create/enable the billing schedule. NOTE: If you are entering an existing customer/deal into the Gateway, which you are already pulling through the ACH Works website, make sure to STOP payment on the ACH Works side. Otherwise, your customer will be debited twice. Once the billing schedule is set up, you have the option to make edits to the information and save the updates; you can issue a one-time payment (either credit or debit) and decide whether you want that payment to apply to the deal; you can stop the debiting schedule and then restart at a later date; or you can delete the debit entirely. You can also see Transactions Activity on this page – we show you the transaction as soon as the information is sent to the ACH Works, and then the various response codes or updates we receive from ACH Works to inform us of the status of the transactions. Transactions typically take 5 business days to schedule, so you can check this page to see the transaction’s progress up to that point. 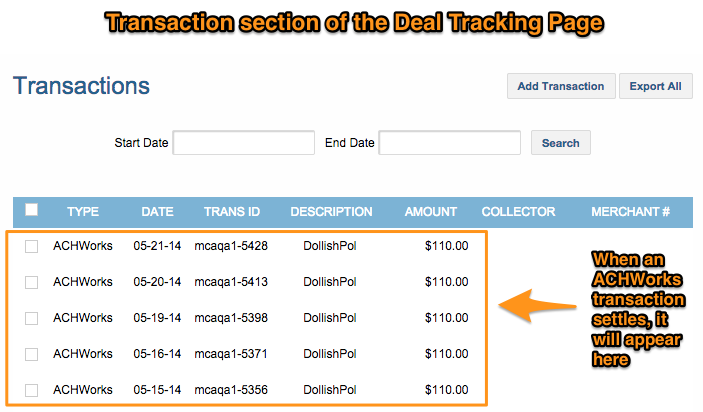 When the transaction settles, it will be applied to the deal and will appear on the Deal Tracking page, in the Transactions table. i) the deal’s Amount Repaid percentage. You can click on the pencil icon to edit the billing schedule information, or the trash can to delete it entirely. MCA suite will highlight in orange any billing schedule that contains errors, such as a returned transaction or a transaction that could not be sent. You can issue a one-time payment for one of your ACHWorks customers, whether as a debit or credit. 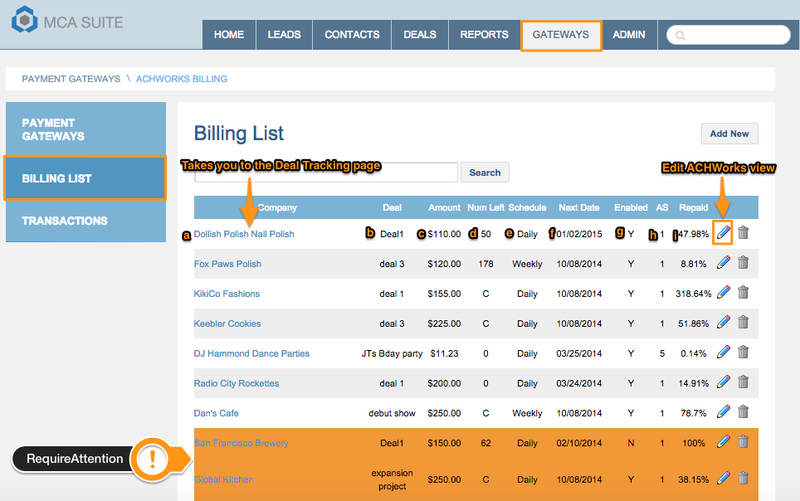 The best way to do this is to click onto that customer’s billing schedule from the Billing List page. 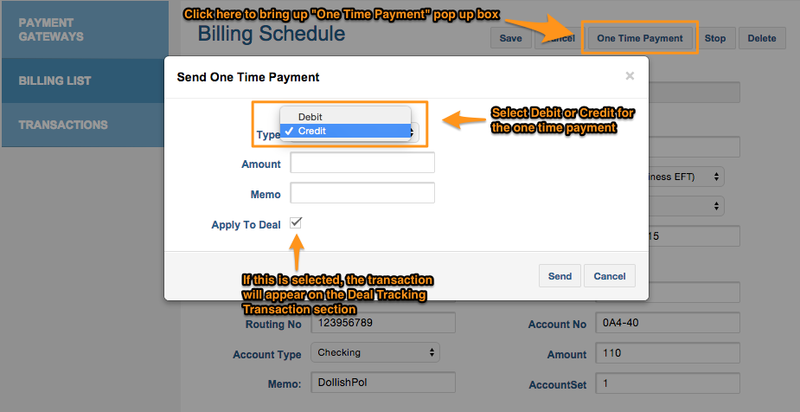 You will see a button at the top called “One-Time Payment.” Click on that button – you will see a modal window asking you to enter the payment information. Select whether you would like the payment to be a debit or a credit, enter the amount of the transaction, and then select whether you would like that payment to be applied to the deal you are collecting on. You might want to send or collect from this merchant but not have that money affect any of the deal numbers.